As I mentioned in yesterday’s post I have released a new pattern in memory of Vivian Robinson to raise funds for cancer research. The quilting community lost a very talented and special designer in November last year after a battle with cancer. As in the title of this post the pattern is called “Flowers for Viv”. All profits from the sale of this pattern will be donated to cancer research. Vivian’s individual style was loved by many and her designs will live on in many a home. She loved using the raw edge applique technique and so this quilt is made in this style, in memory of Viv’s creativity and contribution to the quilting community, in the hope that funds raised towards cancer research may assist future generations overcome this devastating disease. Designers often use symbols to communicate something about their design. Sometimes these are obvious or even subtle, so here is the meaning behind my design. The vase represents Vivian’s creativity. The heart represents her love of quilting & design and also our love for her. The dove is a symbol of hope and affection. The cranberry symbolises thanksgiving. We thank Vivian for her friendship and the love of her craft. The vine is continuous and represents her memory and her designs that will go on forever. The daffodil represents new life as it bursts into flower and symbolises hope for a cancer free future. The pattern is only available through Mrs Martins Quilt Shop and Petals & Patches (will be on my website later this week). Ring Karen on (03)5968 3360 if you would like a pattern. The cost of the pattern is $7.00. Thought I should pop back with an update on the Monbulk Quilt Show. What an amazing day! Caught up with lots of acquaintances & friends and made some new friends along the way. Karen of Mrs Martin’s Quilt Shop and her band of merry helpers do an AMAZING job!!!!! The organisation of such an event isn’t an easy task so hat’s off to all those involved. Looks like they have managed to raise over $5,000 for the Monbulk CFA and they are still counting. Fantastic effort! The first 100 through the door to the show get a free showbag full of goodies. 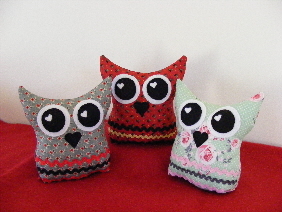 For several years I have given Karen something for the bags – this year was a pattern to make “Luna” my new little owl pincushion/softie/wheatbag. Pictured below. Thank you Karen for inviting me along – I was inspired by the level of talent of the quilt entries. As usual I forgot to take my camera, it was on the floor where I left it when I came home!!!!!!! Say no more ….. So my lovely neighbours, Lisa & Louise of Max & Louise Pattern Co, took some pictures for me. Thanks girls! We had a great day and they were lots of fun. Inspired me to go home and look at my favourite pattern of theirs – now I just need to find some fabric. 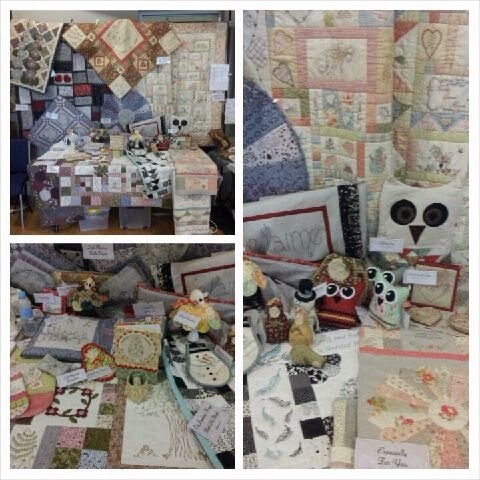 I have borrowed a photo of their stand to show you some of their work!!!! I also had a chance to chat with Barb Smith of Theodora Cleave and couldn’t resist another of her beautiful buttons and her new book, “Travels with Millie”, who reminds me so much of our cat, Jet. Barb’s stand was displayed with her usual flair. Wish I could have taken the whole stand home with me!!!! 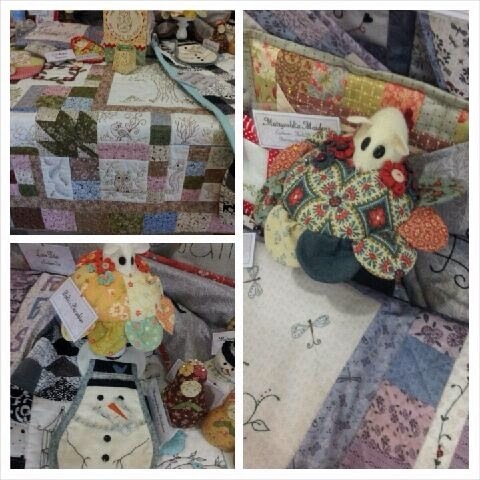 Barb has some pictures of the quilt show on her blog so click on her link above to view. I also caught up with Jo of Sewjo Designs and fell in love with her new bear pre-printed stitcheries. So cute! Gayle, if you happen to read this post, my mother-in-law loved her card and also your business name “In a Pleasance”. Gayle makes the loveliest cards that describing just doesn’t do justice. Karen at Mrs Martin’s has some in stock, so have a look at them if you happen to go for a visit. All the cards designs are different, I had trouble choosing one. There was also a special display of quilts of Vivian Robinson’s. At the show I released a pattern in memory of Viv to raise funds for cancer research. I will have a special post for this tomorrow. All in all it was a great day, lovely weather, lovely ladies and some great laughs!! Where did February go ……………… I know I’ve been very busy and it is a short month but …….. Anyway have been working on quite a few new projects for upcoming events. So I can’t show anything just yet. 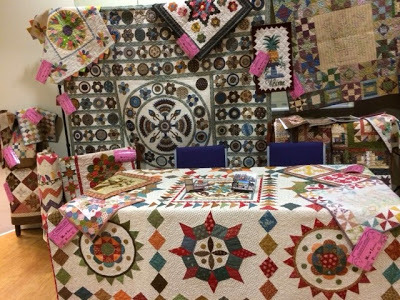 The Monbulk Community Quilt Show is on this coming weekend in Monbulk on the 15th March. I will be having a display at the show so come by and say hello if you are in the area. It is a great show and the first 100 people in the door get a free showbag filled with lots of goodies. This is very popular. The show raises funds for the Monbulk CFA and admission is $5. The CWA holds a cake stall, there are usually Devonshire teas and a sausage sizzle and the local footy team run a plant stall, so it ends up being a lovely day out in the hills and who doesn’t love a shop!!! 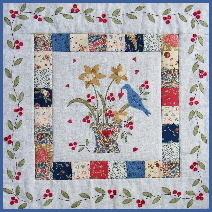 I have also been preparing for the Stitching Soiree held by Lisa from Fig n Berry in April so have been busy stitching. After this is the Australian Quilt Convention in Melbourne at the Royal Exhibition Building in Carlton, so it’s shaping up to be another busy month. 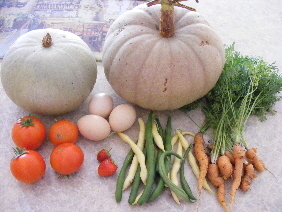 The garden has been neglected this month but it still has been busy producing a nice little crop. This is what I collected from the garden this morning – it is amazing how much you can find when you go looking. From inside the house I wouldn’t have realised how much was out there. Now what’s for dinner tonight – frittata maybe???? I do have one I can show. This is vintage Rose and is a workshop that will be offered in the watercolour technique at The Quilter’s Patch on the 7th June from 10-30 to 12.30pm. 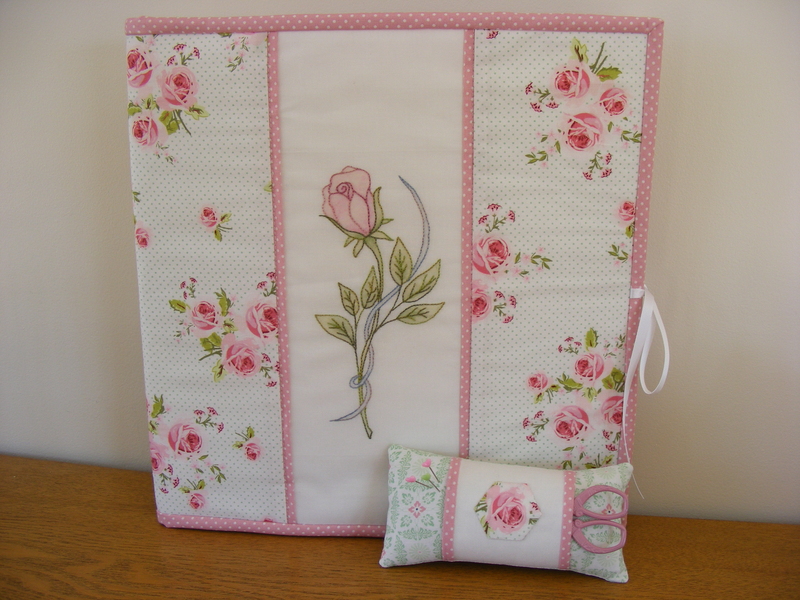 I recently ran this in Rosebud at Sew in Love with Fabric & Thread and the ladies loved it and did a terrific job. In class you learn how to work with watercolour pencils on fabric and start your embroidery. 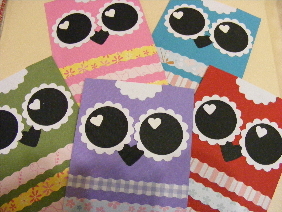 the pattern is of a Patchwork Block Folder and pincushion with scissor holder. Looking forward to seeing you at one of the upcoming events, meanwhile back to stitching …….